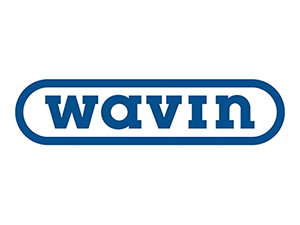 WAVIN : The world’s first PlasticRoad is now open! Home / Allgemein / WAVIN : The world’s first PlasticRoad is now open! The world’s first PlasticRoad is now open! So many invitees turned up to bike the first ever PlasticRoad bicycle path in the Deventerstraatweg in Zwolle on September 11th, 2018. It was history in the making. Where else have you seen a road that can be built in only a matter of days and that can last three times longer than a traditional road? A road made – not from the traditional asphalt, but from recycled plastic. The modular PlasticRoad eliminates concerns about potential safety issues due to potholes and road cracks. Its permeable structure allows excess water to drain quickly and contributes to traffic noise reduction while offering a built-in solution for pipes and cables. 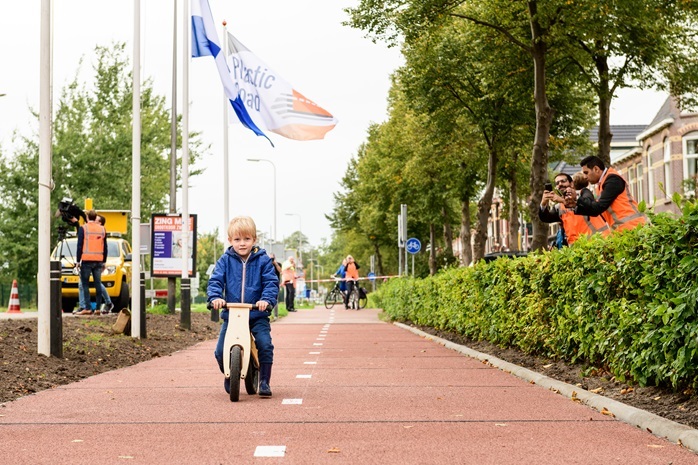 KWS, a VolkerWessels company, Wavin and Total have been working on the development of the first PlasticRoad and it has now come to fruition with the first pilot PlasticRoad – a bicycle path. Anne Koudstaal and Simon Jorritsma (KWS) kicked off the event with “The Road to PlasticRoad” – a presentation of the road, from the first sketches in 2013 to the realization of the world’s very first PlasticRoad bike path in the municipality of Zwolle, The Netherlands. Before everyone cycled to the location where the first PlasticRoad was unveiled, we presented a PlasticRoad module in front of Wavin’s head office. Invited guests were curious to study the structure of the PlasticRoad. On the surface, it looks like any other bicycle path. Ahh, but the magic is in the part you do not see – the recycled plastic construction under the surface! On behalf of the PlasticRoad consortium, we would like to thank everyone who attended the unveiling of the world’s first PlasticRoad bicycle path. What a wonderful day it was! If you want to stay in the loop, you can sign up for the PlasticRoad Newsletter via www.wavin.com/PlasticRoad and receive a free ‘The Road to PlasticRoad’ White Paper. Follow us on Facebook and stay tuned for more news about the launch of the next PlasticRoad in Giethoorn (Overijissel), later this Fall. Gert-Jan Maasdam (Director of Marketing and Technology, Wavin Group) explains how the first PlasticRoad module was realized. Will the roads of our future be built on the plastic waste of today? The PlasticRoad bike path is the first step in the ongoing journey towards building sustainable roads. Today, we designed and built a bike path. And tomorrow? Well, the future looks bright for PlasticRoad. We look forward to taking the concept to the next level. The PlasticRoad consortium (KWS, Wavin and Total) are all delighted to collaborate with the municipality of Zwolle and the province of Overijssel – both of whom welcome the unique opportunity to test the technical and economic feasibility of this innovative pilot road project. 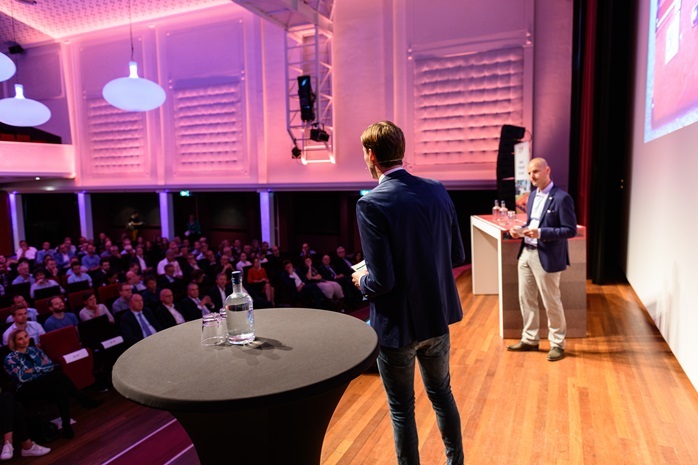 Both Overijissel and Zwolle see the great potential in PlasticRoad – as a solution to the challenges of the future, as it pertains to the circular economy. The ability to see this concept through to practical realization is a dream come true for the PlasticRoad partners, but most especially the inventors of the PlasticRoad concept – Anne Koudstaal and Simon Jorritsma. And, as you can see from the photo below, the next generation seems to appreciate this sustainable innovation! You can find photos of the event on the Wavin Group Facebook page. Cycling a PlasticRoad bicycle path may be a unique moment today, but tomorrow (say, twenty years from now) it may very well be the most common thing in the world!